Laraaji Nadabrahmananda (b. 1943 as Edward Larry Gordon) is a meditator, laugh-master and cosmic musician. After working as a stand-up comedian and actor, he discoverd Eastern mysticism in the early seventies. He started using zither and turned it into an electronic instrument, playing it as a piano. In 1979, he was playing in Washington Square Park when Brian Eno discovered him. 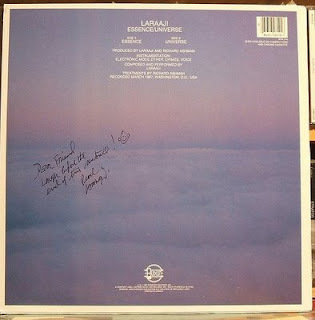 They recorded “Ambient #3—Day of Radiance" released in 1980. 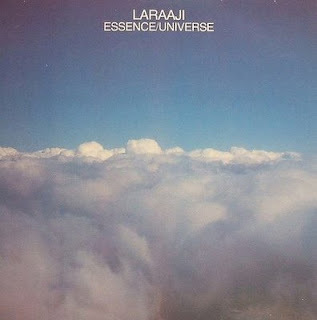 In addition to concerts Laraaji has been an contributor to healing arts festivals and conferences as his celestial sounds create a warm and soothing atmosphere for both presenters and visitors. The Healing Sounds Intensive with Jonathan Goldman, the Life Spectrums Conference and the Freedom Healing Arts Festival are listed as his annual conferences. A devotee of the late Shri Brahmananda Sarasvati, founder of the Ananda Ashram in Harriman, New York, Laraaji is the creator and facilitator of Laughter Meditation Workshops in the United States and abroad; empowering workshops that acknowledge and honor the ability of our laughter to take us into deep relaxation and receptivity to meditation. Dive into "Esence/Universe" (1987) here (1) and here (2). Healing Sounds Intensive amazing video here. Thanks to MG for the tip.